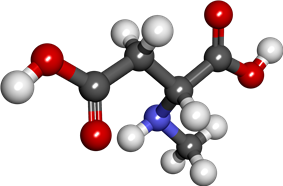 N-Methyl-D-aspartic acid or N-Methyl-D-aspartate (NMDA) is an amino acid derivative that acts as a specific agonist at the NMDA receptor mimicking the action of glutamate, the neurotransmitter which normally acts at that receptor. Unlike glutamate, NMDA only binds to and regulates the NMDA receptor and has no effect on other glutamate receptors (such as those for AMPA and kainate). NMDA receptors are particularly important when they become overactive during withdrawal from alcohol as this causes symptoms such as agitation and, sometimes, epileptiform seizures. 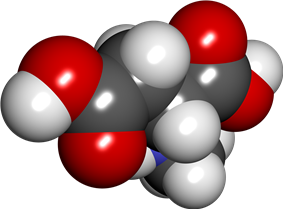 NMDA is a water-soluble synthetic substance that is not normally found in biological tissue. It was first synthesized in the 1960s. NMDA is an excitotoxin (it kills nerve cells by over-exciting them); this trait has applications in behavioral neuroscience research. The body of work utilizing this technique falls under the term "lesion studies". Researchers apply NMDA to specific regions of an (animal) subject's brain or spinal cord and subsequently test for the behavior of interest, such as operant behavior. If the behavior is compromised, it suggests the destroyed tissue was part of a brain region that made an important contribution to the normal expression of that behavior. However, in lower quantities NMDA is not neurotoxic. In fact, normal operation of the NMDA receptor allows individuals to respond to excitatory stimuli through the interrelated functioning of NMDA receptors, glutamate, and dopamine. Therefore the action of glutamate specifically through NMDA receptors can be investigated by injecting small quantities of NMDA into a certain region in the brain: for example, injection of NMDA in a brainstem region induces involuntary locomotion in cats and rats. The mechanism of stimulating NMDA receptor is a specific agonist-binding to its NR2 subunits, and then a non-specific cation channel is opened, which can allow the passage of Ca2+ and Na+ into the cell and K+ out of the cell. The excitatory postsynaptic potential (EPSP) produced by activation of an NMDA receptor also increases the concentration of Ca2+ in the cell. The Ca2+ can in turn function as a second messenger in various signaling pathways. This process is modulated by a number of endogenous and exogenous compounds and plays a key role in a wide range of physiological (e.g. memory) and pathological processes (e.g. Excitotoxicity). Examples of antagonists of the NMDA receptor are APV, Amantadine, dextromethorphan (DXM), ketamine, tiletamine, phencyclidine (PCP), riluzole, memantine, methoxetamine (MXE), methoxphenidine (MXP) and kynurenic acid; the latter is the only known endogenous antagonist. They are commonly referred to as NMDA receptor antagonists. ^ "N-Methylaspartate - Compound Summary". PubChem Compound. USA: National Center for Biotechnology Information. 24 June 2005. Identification. Retrieved 9 January 2012. ^ Dingledine, R; Borges K (Mar 1999). "The glutamate receptor ion channels". Pharmacol Rev. 51 (1): 7–61. ^ Liu, Y; Zhang J (Oct 2000). "Recent development in NMDA receptors". Chin Med J (Engl) 113 (10): 948–56. ^ Cull-Candy, S; Brickley S (Jun 2001). "NMDA receptor subunits: diversity, development and disease". Current Opinion in Neurobiology 11 (3): 327–35. ^ Paoletti, P; Neyton J (Feb 2007). "NMDA receptor subunits: function and pharmacology". Current Opinion in Pharmacology 7 (1): 39–47.